Hello friends! It’s been a little while since I have posted. 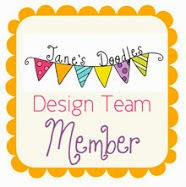 Not because I haven’t been card making, just because life has been super busy and I haven’t got around to posting! 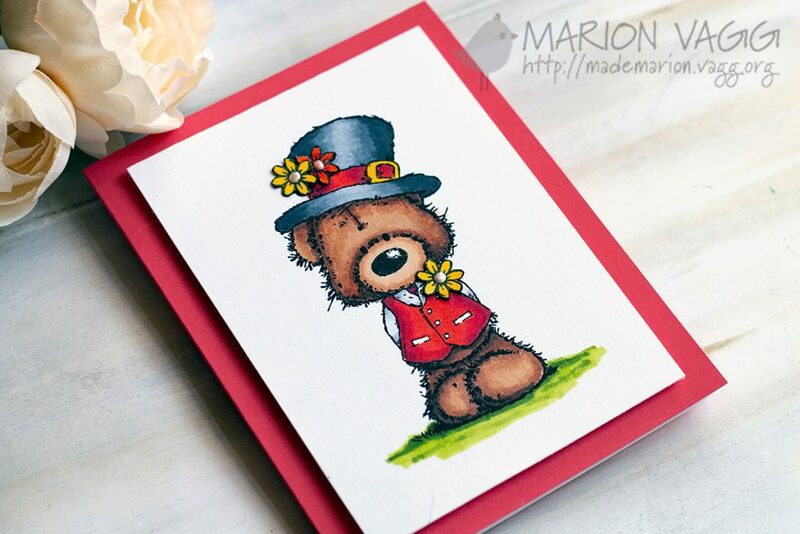 Today’s card is another adorable Penny Black critter from the Timeless release called Flower Teddy, which I haven’t had a chance to colour until now. I reached for Copic markers again (no surprise there), but I spiced things up a bit with an artsy and inky border. The border was created by die cutting an oval from white card stock and then inking it with Salty Ocean Distress Oxide ink. I them spritzed the PB Honeycomb stencil with water and placed it randomly onto the inked border (where the water bleached the ink). To add to the distressed look, I also flicked on water, added some Chipped Sapphire Distress Oxide ink and then in some places, inked over the stencil. The sentiment is from the Happy Hugs stamp set (which I only stamped the Hugs and left off the Happy part). 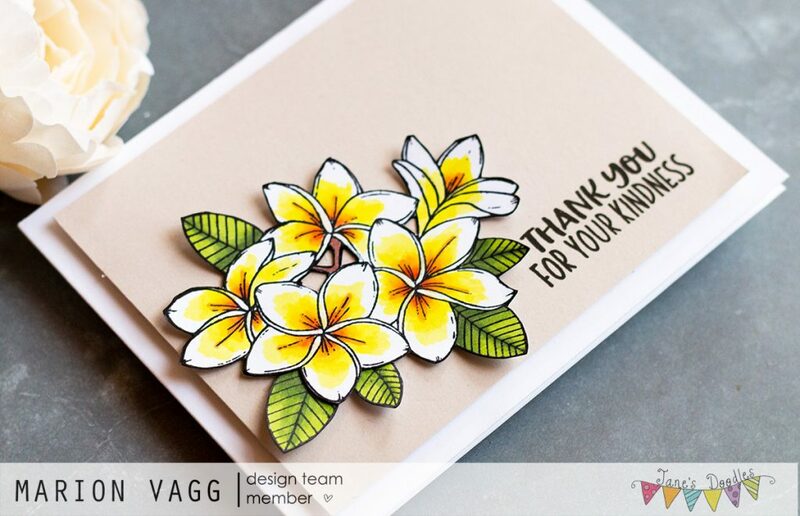 I finished off the card with some white gel pen details on the flowers and grounded the image by creating a floor with Prismacolor pencils. Hi! I’m back with the final instalment of my Penny Black Timeless inspiration posts. I have saved some cuteness for this last post. I have made two cards using the Special Friends stamp set as well as the Butterfly Garden stamp set. I also used the coordinating Special Friends Cut Outs coordinating dies. I stamped out the four critters from the set and used the coordinating dies to cut them out, along with the sentiment banner. All images were coloured with Copic markers. To create the foliage underneath the banner, I first drew around the banner lightly in pencil, so that I could position and stamp the greenery in just the right position. I used a mixture of green pigment inks and also a pink pigment ink to stamp the leaves and flowers. I then adhered the sentiment banner with 3D mounting foam tape, and added the critters in last, directly adhering them to the card base. This second card is exactly the same as the first, but I just changed the animals. I think they turned out so cute! And one has already made it into the hands of my daughter’s friend for her birthday. To view and or purchase any of the new products from the Timeless release, head to the Penny Black online store. Happy Sunday! I’m back with the third instalment of my Penny Black Timeless inspiration posts. I hope you have been inspired even just a little bit! 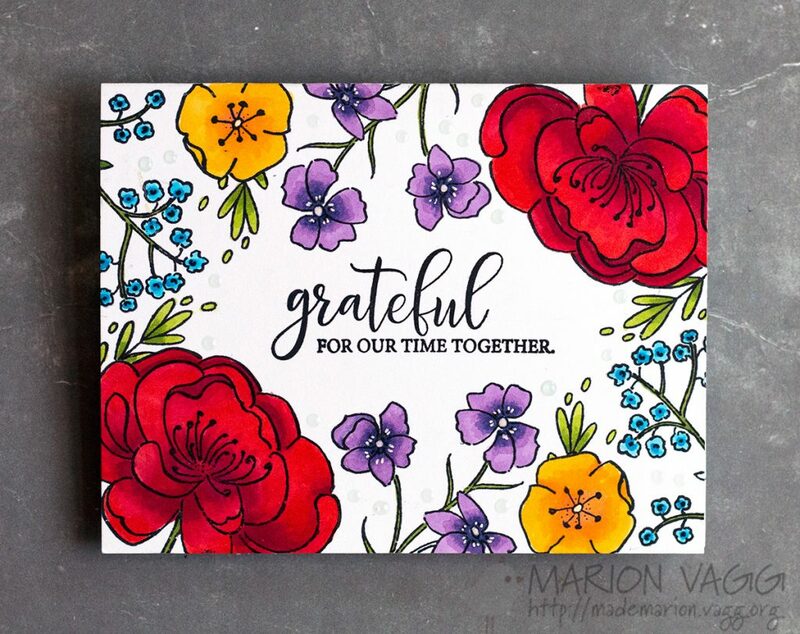 Today’s colourful one-layer card uses the Delicate Beauty stamp set and the sentiment is from a set called Grateful Sentiments. 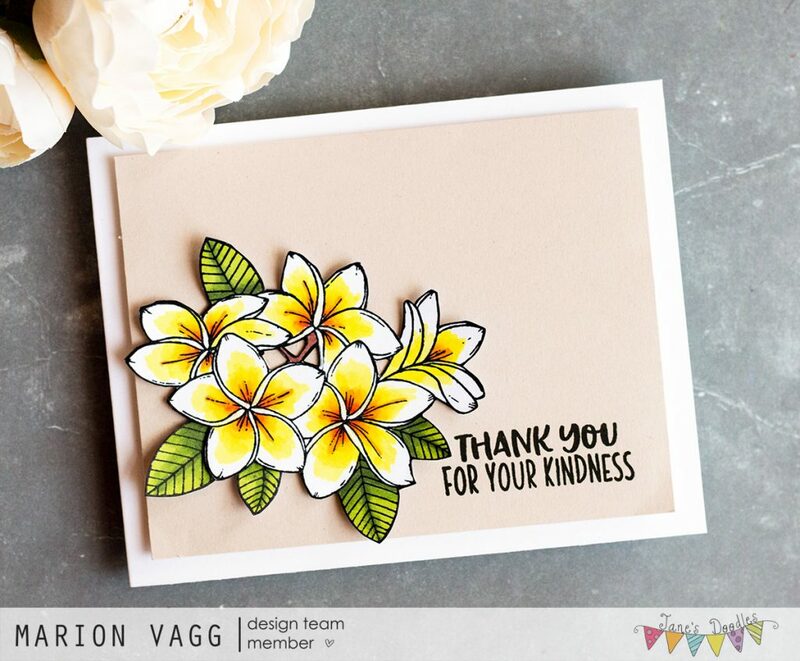 What I love about this sentiment set is that it comes with the beautiful scripty font (Grateful and Thank you) and then it has all these smaller sentiments. It is one very versatile set. 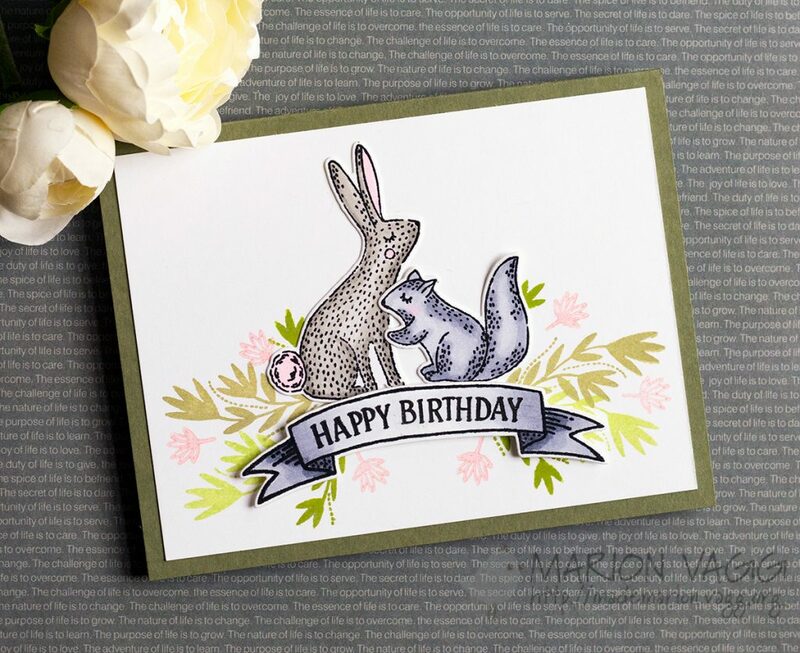 To create this card, I first stamped the sentiment in the middle of the card front. I then stamped the images around the sentiment – and what I stamped on the top, I turned around and stamped on the bottom. All coloured the florals with Copic markers. When I had finished the card, I thought it needed some more greenery, so I added in some leaves from the Butterfly Garden set and coloured them in green. It looked more balanced after that. To finish, I added some Seaglass Nuvo drops and added some detail with a white gel pen. And while I’m talking about gel pens, I’ve found a new one which I just love! It is juicy and goes on so smoothly. It is a 1.0mm ball medium white Pentel pigment ink pen. I am loving it! Hello! As promised I am back with the second instalment of my Penny Black Timeless inspiration posts. Today I have used a cute and adorable bear stamp called Irish Luck. I decided to change things up a bit though, as I didn’t need a good luck card in my stash. So in order to cover up the four-leaf clovers, I used a small flower image from an older Penny Black set called ...So Loved. I was not sure about a sentiment, so I ended leaving it off. I can always add one later if need be. I hope you had some fun hopping along with the Penny Black Timeless Blog hop on Monday. There is still time to win some awesome prizes, so if you are still looking to hop along, start here. Over the next week or so I will be posting some more cards using products from this latest Timeless release. I have had an absolute blast with this release, so buckle up, because this is Day 1 of more Timeless inspiration. Today’s card is a really pretty and feminine one using the Harmony cling stamp. 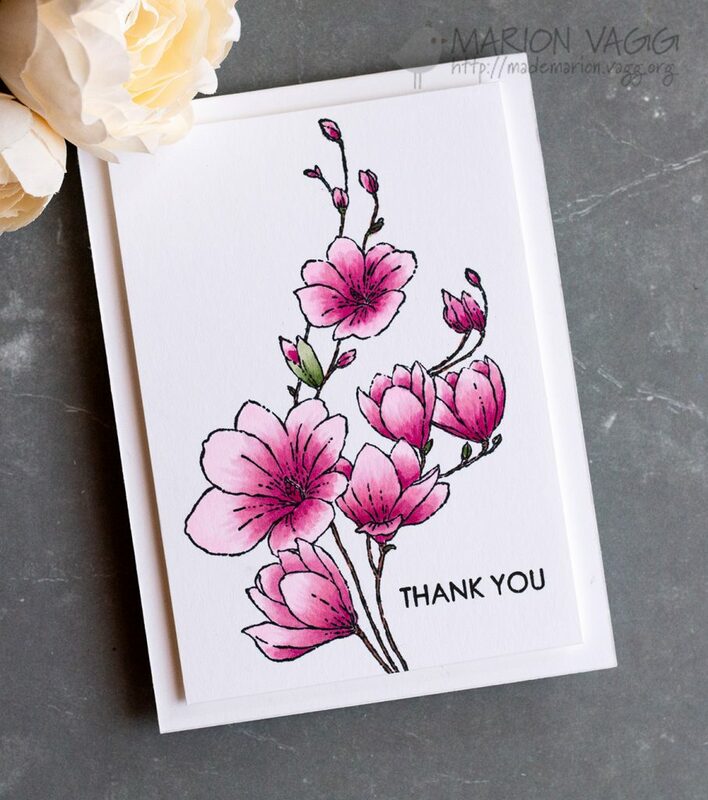 This card is quite simple, as these beautiful florals only needed to be coloured (and I used Copic markers again). 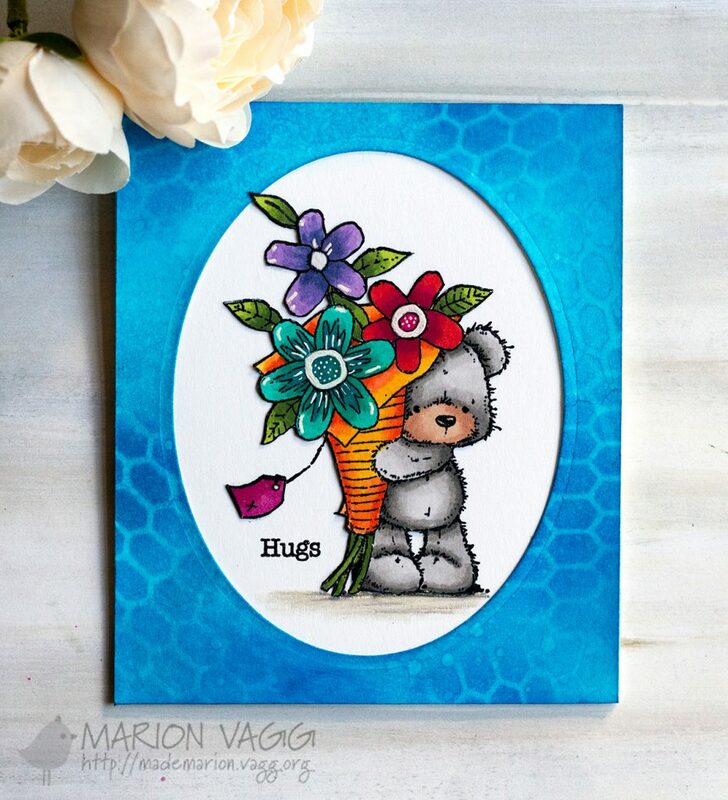 The sentiment fitted in perfectly into the space, and it is from the Flower Teddy stamp set. Clean, simple and elegant – just the way I like it. Head to the Penny Black online store where all the new products are now available for purchase. NB: If you are looking for the Penny Black Timeless Blog hop, scroll down to the post below, or go here. Hello! 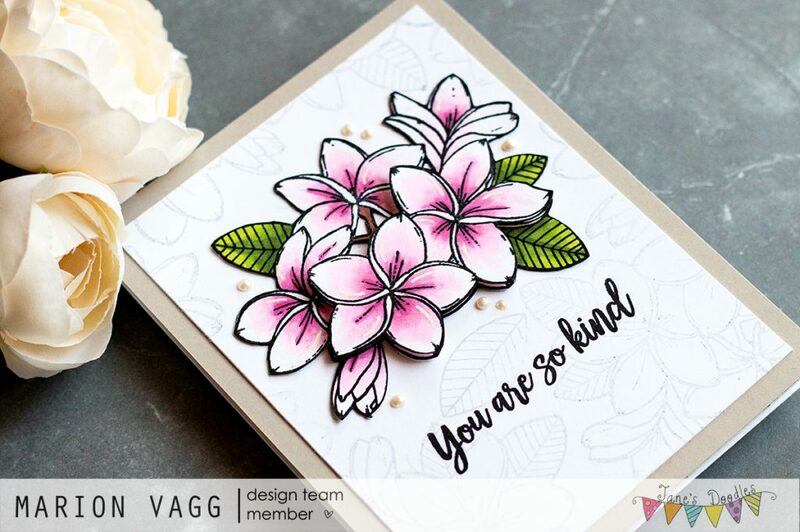 Welcome to another Jane’s Doodles blog hop where the Design Team are showcasing Jane’s latest stamp release – two new stamp sets. You should have arrived from Kaja’s awesome blog. If you get lost along the way, there is a list of blog hop contributors at the end of this post. 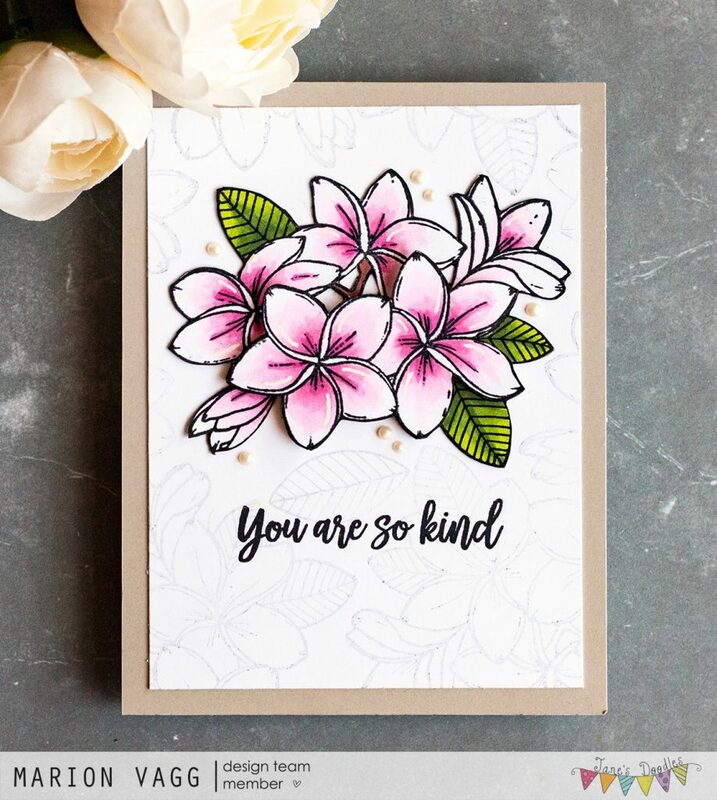 Today I have made two cards using the new Plumeria and Kind stamp sets. In Australia we call this gorgeous flower a frangipani. I have one growing in my garden. Frangipanis are still very much blooming in my neighbourhood. These flowers scream summer to me! I stamped and coloured the images on both cards with Copic markers. I fussy cut them out and stamped the sentiment from the Kind set. I did exactly the same thing for this card, however I lightly stamped the image onto the card base in a light grey ink. This one has a little bit more dimension as I popped up some of the flowers from the cluster with foam tape. In addition to Jane having a 20% off sale on all clear stamps until Wednesday, she is giving a stamp set of your choice to one lucky winner. All you need to do is comment on all the blogs in the hop and you’ll be in with a chance to win! Good luck! Your next stop on the hop is Milka’s blog. Thanks for stopping by today and happy hopping. 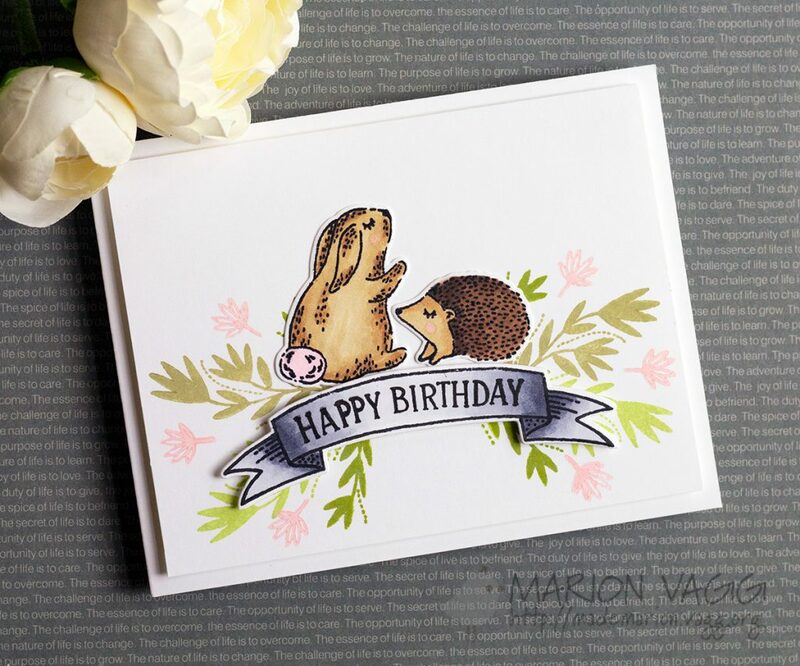 It’s a “Party with Penny!” You’re invited to join in the fun as Penny Black celebrates the release of their newest collection of stamps and dies, Timeless. You should have arrived here from Suzie Lessard’s blog. If you want to start the hop from the beginning, you can go to the Penny Black blog for a complete list of all of the blog hop participants. Well to get this party started, I have two cards to share with you today. 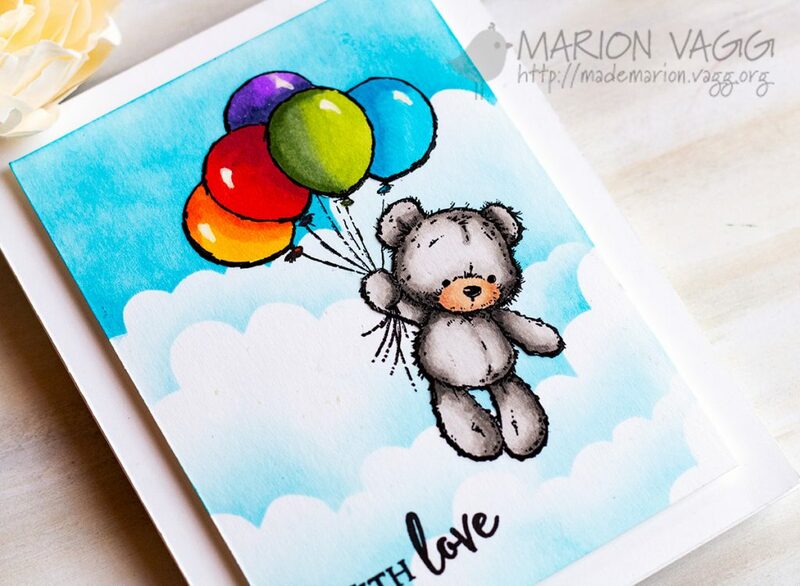 The first card uses this A.D.O.R.A.B.L.E Penny Black bear from the set called Balloon Ride. 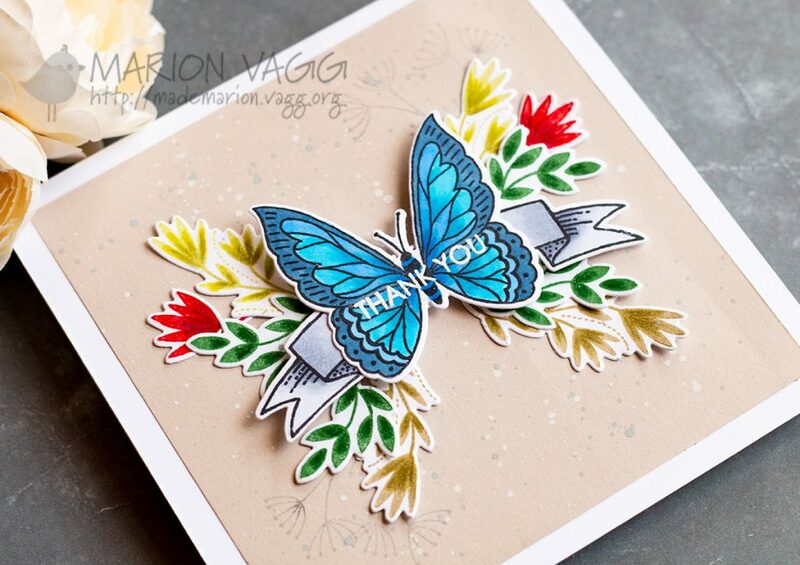 The sentiment is from the Butterfly Garden stamp set. I coloured the images with Copic markers and fussy cut them out. For the background clouds, I hand cut a cloud mask from masking paper and sponged on the clouds with some blue ink. 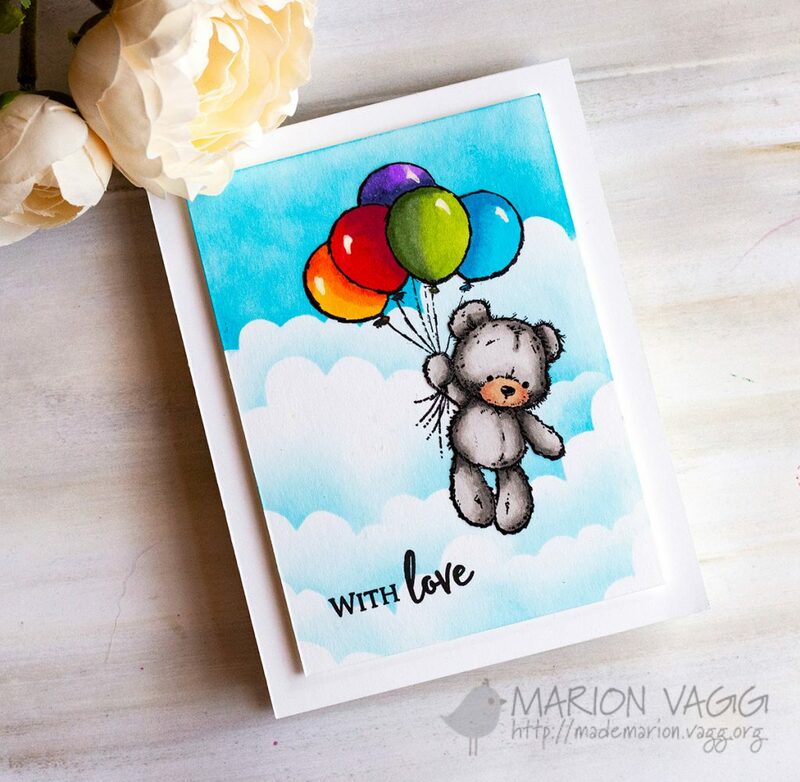 I then re-stamped the bear and balloon image on top of the clouds and adhered the fussy cut bear and balloons over the top. 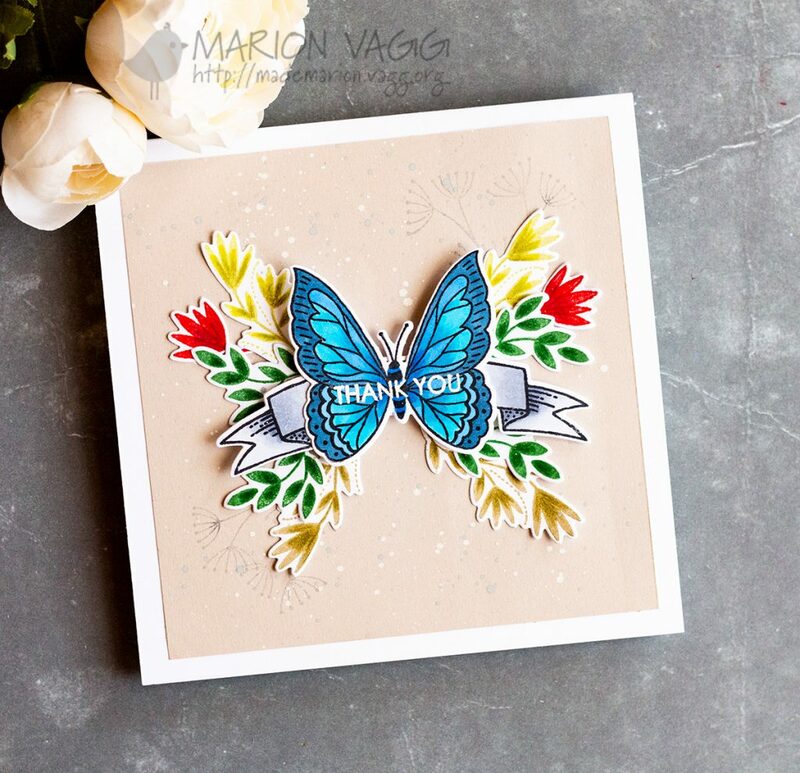 My next card uses a mixture of two stamp and their coordinating dies – Butterfly Garden and Butterfly Garden Cut Out and Special Friends and Special Friends Cut Out. 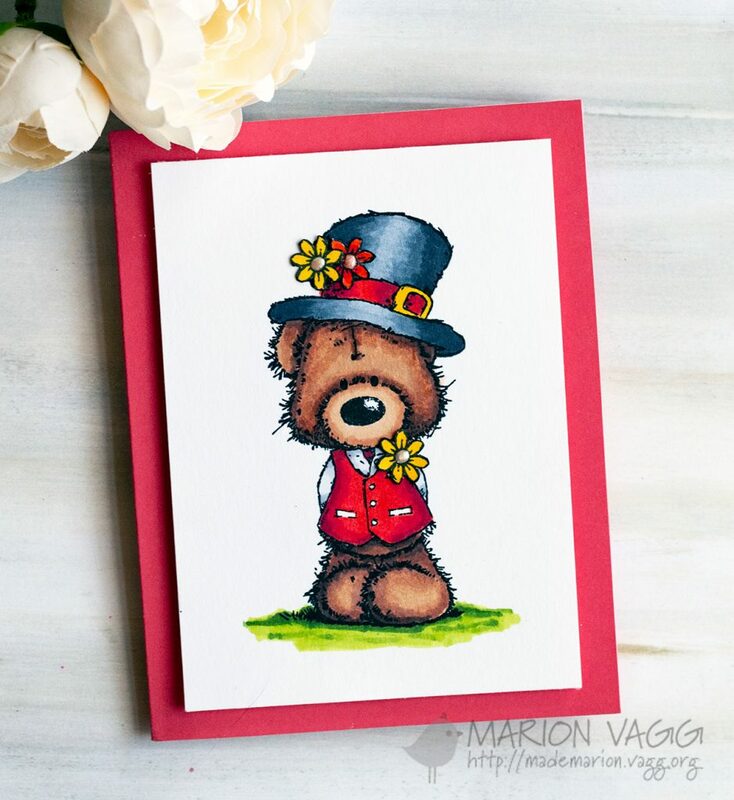 The sentiment is from the Flower Teddy stamp set. The butterfly and banner were coloured with Copic markers and die cut using the coordinating dies. The foliage behind the butterfly was stamped in coloured ink, and I added some detail and shading with matching Prismacolor pencils. After a lot of image shuffling (and I mean a lot…), I decided on this layout and I love it. The sentiment was white heat embossed over the top. And it wouldn’t be a party without a giveaway; right? Penny Black is giving away a $50 shopping spree to the Penny Black online store to FIVE lucky winners. To enter, leave a comment on any blog hop post (this one included). The giveaway closes on Sunday, March 10 at 11:59 PM PST and winners will be announced on the Penny Black blog on March 18. Stamps: Penny Black 30-545 Balloon Ride stamp set, PB 30-558 Butterfly Garden stamp set. Stamps: Penny Black 30-558 Butterfly Garden stamp set, 30-561 Special Friends stamp set. Thanks for stopping by today. All these new products from the Timeless release are now available in the Penny Black online store. And now… keep hopping! Your next visit is Heather Telford.